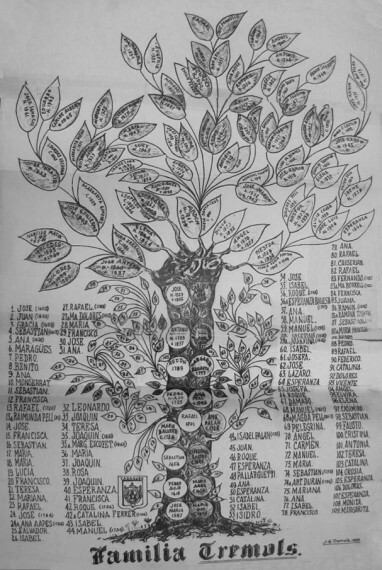 Click here to go directly to the online Cuban genealogy site. Florida International University Libraries has unveiled an online resource to help families of the Cuban diaspora research their roots—and already several have hit pay dirt. An extensive set of family trees, civil records and sacramental documents is now available on the Internet. It references thousands of Hispanic surnames and gives everyone from the Abadias to the Zúñigas the opportunity to search for their ancestors. The material comes from the Enrique Hurtado de Mendoza Collection of Cuban Genealogy, a treasure trove that also features hard copies of more than 3,500 17th- and 18th-century books, long out-of-print publications and periodicals that few, if any, other U.S. libraries hold. The free online offerings can be accessed by going to FIU’s Digital Library of the Caribbean and searching by last name. The collection was amassed over more than four decades by Felix Enrique Hurtado de Mendoza. Trained as a lawyer, he worked as a diplomat for the Organization of American States, both in Washington, D.C., and Geneva Switzerland. Nearing 90, Hurtado de Mendoza lives in Miami and directed his family to deliver the collection to FIU in 2012. Hurtado de Mendoza spent decades seeking succession rights to a title of nobility, a stake for which he eventually secured proof but later lost to a distant relative with a better claim. His hunt involved writing hundreds of letters to fellow genealogists in Spain, the Canary Islands and Latin America. Along the way he broadened his scope to include countless other family lines that lead to places such as Argentina, Nicaragua, Chile, Costa Rica, Colombia and Venezuela. Organizing and scanning the mostly handwritten genealogies took more than three years and was accomplished by Del Pino and Mariela Fernandez, both born in Cuba and today officers of the Cuban Genealogy Club of Miami. “What kept us going was we knew of the need that there was for this material,” Del Pino said. She compared the online collection to what is available for surnames of other backgrounds on the popular family-history web site Ancestry.com, which provides high-quality resources and the chance to connect with other genealogists. “This was going to be our very own equivalent of Ancestry.com,” she said. FIU’s Silvera encourages family historians to dig into the collection, whether online or in person. “I just hope that people will enjoy the chase,” she said. Those within reach of the Green Library at FIU’s Modesto A. Maidique Campus in Southwest Miami-Dade County can examine the physical collection weekdays between 9 a.m. and 5 p.m. on the library’s fourth floor. Already a number of individuals around the country have utilized the online resource with great success and shared their triumphs via e-mail. Assistance with the online library is available by emailing Brooke Wooldridge, bwooldri@fiu.edu. SOUND GREAT SURE WOULD LIKE TO TRY ……..BEEN WORKING ON MY TREE FOR YEARS…….NOW MAYBE I WILL GO AROUND THE STONE WALL I HAVE ENCOUNTERED !!!!!!!!!!!!!!!!!! I have been using Ancestry.com and would love to see how many of my ancestors made Cuba their home. I know so little about my family. Gracias por ayudar a las familias Cubans a encontrar sus origenes. I would like to search for my family tree. I am an alumni from FIU and a retired librarian and was wondering, can the collection be accessed remotely from home? What is the link ? Thank you. Thanks for providing this information. I will most certainly use it. Looking for Jose Monserat in Ciego De Avila, Cuba believed to have migrated from Barcelona (French Catalonia) region. My parents are both from Cuba ….My mothers maiden name Ada Marin, daughter of Diego o. Marin and Zoila Hernandez. My father Walter Perez-Gell son of Lorenzo Perez-Gell and Aurora Alfajate Would like to know my family tree. My paternal grandfather was from Galicia. I would like to now all about them; and I don’t now nothing about maternal grandfather. Would you please help me??. Thank you.